Anyway let’s get to the review! I was lucky enough to come across this book by Amy Greenfield earlier this year and just now had the time to sit down with it. The cover drew me in right away. It’s alluring with it’s tagline “Sing and the Darkness Will Find You.” I was hooked! What was great was how well that really rang true with the novel itself. The story was alluring. Before I jump into my thoughts any further, here’s the details you need to know! Lucy, shipwrecked on an island at 8, is forbidden to sing by guardian Norrie. On All Hallows Eve 1667, at 15, she sings, and is swept into darkness. She wakes to hear powerful men hunt Chantresses who sing magic into the world. At the Invisible College she finds sanctuary, plots to overthrow the evil Lord Protector, and distrustful scientist-apprentice Nat. Only a Chantress can overcome the Protector, and Lucy is the last in England. The beginning of the book drew me in more than most books. Lucy was shipwrecked on this island with only her guardian Norrie. As Lucy grew up she knew only the life she had lived with Norrie on the island and that meant absolutely no singing. But as the days grow closer to All Hallows Eve the year Lucy is 15, she begins to hear voices singing when she is outside. The intense desire to sing is too strong for Lucy and her curiosity combined lead to a life-changing occurrence when Lucy opens her mouth and sings. Instantly she is thrown into an unfamiliar world and is fortunately found by Nat, an apprentice and member of the Invisible College. With his help and the guidance of the Invisible College, Lucy learns about her ability as a Chantress, her power to overthrow the evil Lord Protector, and the strength that lies within her. Greenfield did a great job of introducing a unique story into the Young Adult fantasy genre. I enjoyed her take on magic and the story arc of Lucy. Although the overall story seems similar to other novels in the sense that one girl has the power to “save the world” from evil, the specific story of Lucy was entertaining. The idea of singing as a form of magic isn’t unique when looking through history, but the way Greenfield presented it in this story made it seem fresh. I know that I haven’t read anything recently with this type of magical power and it was refreshing to experience a new thing on the fantasy market. What made this story really work was the setting. Having Lucy’s story take place in the late 1600s really made the story believable as a reader and really matched the form of magical power she chose for Lucy. This setting was a prime time for the rise of science and the condemnation of anything “witch-like,” “unexplainable,” or paranormal.” This made the secondary characters’ actions believable as well. What I really loved about the book was the slow relationship build between Nat and Lucy. For a good number of books, the attraction is instantaneous and the relationship (or chemistry) builds fast. But with Chantress the relationship grew slowly. It wasn’t a so-slow-I-don’t-think-it-will-ever-happen kind of slow, but an easy, natural, more like real life kind of slow. Nat wasn’t trusting of Lucy and her powers and Lucy didn’t trust Nat and his ties with the Invisible College. Both characters grew in trust and eventually into like. Since this is the first book, the relationship is still building and I can’t wait to see it develop more in the following novel. Another thing I really liked about Chantress was one of the villains. Lord Protector, the main villain, was a typical “I want to rule the world” kind of villain that needed a reality check. But the Shadowgrims were what impressed me. I loved new creatures because I love how the author had such a great imagination to invent them. The Shadowgrims reminded me of the flying-monkeys in The Wizard of Oz as well as the dementors from Harry Potter. Shadowgrims are ravens that can read your minds. They have a certain way of torturing you until your mind tells them everything they want to know. ‘And attack they do,’ Penebrygg said. ‘But not with beaks and talons. They brush their feathers against your skin feeding on your thoughts as they once fed on carrion and flesh. Their touch is like fire, scorching and searing you. The terror scalds your very soul. And as you burn, the Shadowgrims pick at your mind, stripping away thoughts they later share with Scargrave’ (p.64). Readers do get to see this in action too. I know the above passage is more tell versus show like readers like to see, but I like the description all the same. I’m sure it scared Lucy just as much as it intrigued me. That leads me into my few faults with the story. There was some more tell versus show then I would have liked to have seen within the novel. This brought the pace of the story down. I know it’s really hard to show instead of telling as a writer. It’s something I struggle with myself, so I can sympathize. Hopefully Greenfield will clean this up in the second book with more action now that Lucy is a more developed character. The middle of the book was also a little slow while building up for all the action at the end. It focused a lot on her trying to gain control of her powers while the Invisible College continued to learn more about the right time to take down the Lord Protector. Although this was the slowest part of the book, it was also the part where we saw more glimpses of the Nat and Lucy relationship development. The characters interacted more together alone and were able to blossom as a love interest. Overall, the novel was an interesting read. If you like YA fantasy with some romance I would definitely recommend the book to you. I have high hopes for the second book to continue the story. I can’t wait to see what direction she takes it in and what challenges will arise for Lucy. Will Lucy and Nat’s relationship build more? Are there any more chantresses out there? 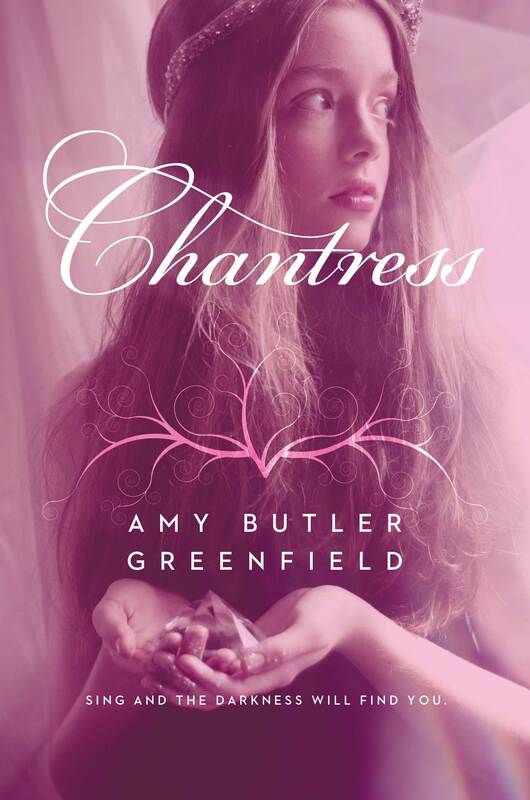 Still unsure if you want to read Chantress? Amy Greenfield let’s you read the first chapter on her website here! Have you read Chantress? What are your thoughts on the magical elements of the story? How do you feel about Lucy and Nat? What do you think is going to happen next? Leave your thoughts in the comments below or tweet them @PopCrunchBoom!